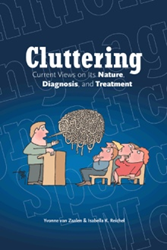 In “Cluttering: Current Views on its Nature, Diagnosis, and Treatment” (published by iUniverse), two internationally renowned experts on cluttering, Dr. Yvonne van Zaalen and Dr. Isabella Reichel, present a comprehensive guide about this unique language-based fluency disorder. Readers may visit https://www.iuniverse.com/Bookstore/BookDetail.aspx?BookId=SKU-000660610 to purchase and know more about the book. The authors help readers to understand the complicated disorder known as cluttering, while providing numerous therapy activities and exercises that can be directly incorporated into treatment of people who clutter. Potentially confusing topics are presented with clarity; controversies are explained in accessible terms; and the varied presentations of the condition are sorted so clinicians can approach their clients in an orderly and organized fashion. Examples of the types of information presented include: defining cluttering (including historical perspectives), differential diagnosis between cluttering and stuttering (as well as numerous other conditions), public awareness and perceptions of cluttering, a wide range of key symptoms for clinicians to evaluate, detailed diagnostic procedures that examine more than just overt speech behaviors, and a careful consideration of therapy development and planning. (J. Scott Yaruss, PhD, CCC-SLP, ASHA Fellow Board-Recognized Specialist in Fluency Disorders,Associate Professor, University of Pittsburgh, Co-Author, “School-Age Stuttering: A Practical Guide and Minimizing Bullying for Children Who Stutter”). This book also invites discussion on how to best proceed and may be inspiring for researchers in the field as well. Dr. Yvonne van Zaalen’s contributions as an internationally renowned researcher and educator have led to advances in an understanding of the neurological and linguistic nature of cluttering, assisted in its differential diagnosis and provided concrete and scientifically substantiated cluttering treatment. She is a past president of the International Cluttering Association. Dr. Isabella Reichel educates professionals about cluttering worldwide. She coordinates international research, publications and seminars among speech-language pathologists and other professionals. She is the chair of the Committee of International Representatives of the International Cluttering Association.